Off to daycare or school? They’ll need labels! Personalising is the answer to any woes about lost property at daycare or school. Last year my son lost many objects and items of clothing but most of them made their way back to him thanks to my scrupulous labelling. Here’s Babyology’s walkthrough of the labelling options available to you. 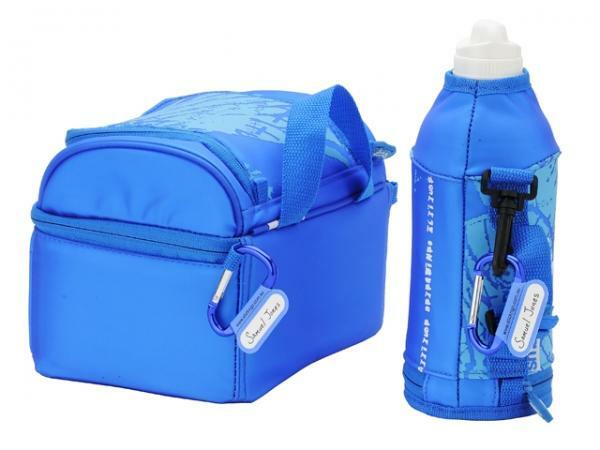 You may also want to check out our backpack and bottles features for those thinking about what they’ll need for the coming year. 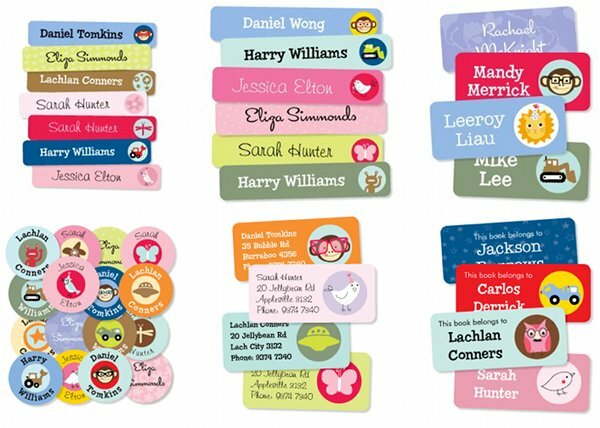 Mooo is the king of personalisation, with a huge array of goods just waiting for your child’s name to be stamped on them. 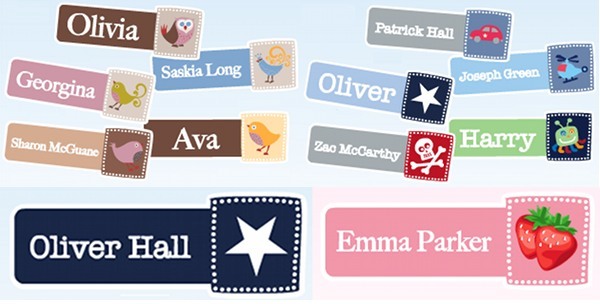 Labels are Mooo’s specialty with a gazillion designs and colours to choose from. They even make shoe dots so there will be no mistaking whose sandals are sitting by the sandpit! Label packs start at $19.95 and Assorted Value Packs from $39.95 at Mooo. We just love the Penny Scallan collection of labels at Stuck On You and there are many others too – from Matroyshka dolls to combi vans and zoo animals to quirky monsters. Packs start as low as $14.95 at Stuck On You. Identity Direct have a huge collection of back-to-school labels – from the plainest stickers through to ornately decorated ones, there are loads to choose from! You don’t want to ruin that pretty pencil case or brand new backpack with permanent marker now do you? Unfortunately that’s what many of us turn to when we realise the sticky labels we’ve bought are great for most things, but not for all. This is when you’ll need Stick ‘n Go Clip ID tags – it attaches simply with its carabiner clip onto anything with a handle, strap or loop to slip it through. Write the appropriate details on the tag, clip and you’re away, in the knowledge that your gear has the best chance of finding its way back to you if lost. 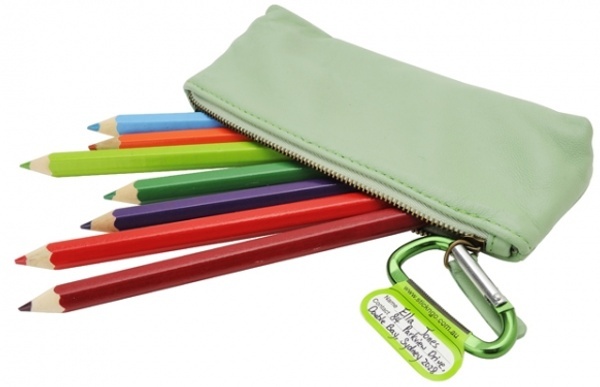 Just $9.75 for a twin pack in green, pink, blue or grey, from Haggus and Stookles. Oliver’s Labels, based in the US, have designer prints that will be stylish from preschool through to high school. Featuring Robert Cavalli animal print, Pucci swirls, signature Missoni zigzags or Burberry check, Betsey Johnson stylised roses and a range of pretty Liberty florals, my favourite is the retro-cool London Carnation design. 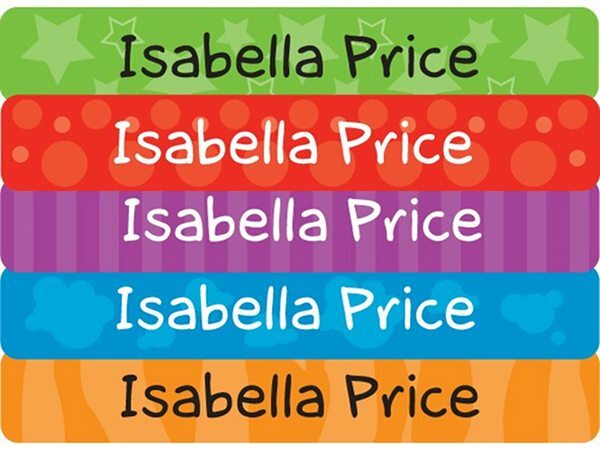 Name labels, shoe labels, iron-on clothing labels, bag tags and more are all available – a pack of forty name labels is US$19.99. Of course, packages are available from US$26.99 – guaranteed to keep you in labels for years! Oliver’s Labels ships to Australia.